If you need to remodel a bathroom in your home in Des Moines, IA, and are searching for a reliable local company to perform the work you require, turn to U.S. Patio Systems and Home Remodeling. 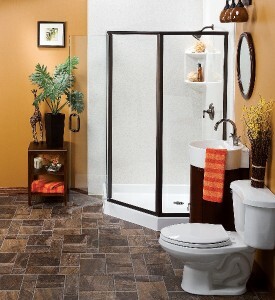 We proudly offer a variety of different ways in which you can bring your old, unattractive bathroom up to date. Bathtub and shower replacement – U.S. Patio Systems and Home Remodeling is an authorized dealer of acrylic replacement tubs and shower systems made by Bathwraps. These products are highly durable, easy to maintain, and customizable in a variety of different ways. A Bathwraps shower, for example, can be customized in just about any style, size, and configuration you like, and can be outfitted with a variety of accessories such as soap dishes, corner caddies, and safety grab bars. Walk in tub installation – A popular way that many of our customers choose to remodel a bathroom is to install a walk in tub. Our Safe Step walk in tubs combine the luxury of whirlpool spas with safety features that are designed to make bathing safer for people with limited physical mobility. These features include built-in safety hand bars, anti-slip surfaces, low threshold entry/exit door, and anti-scaled technology. Other upgrades – Chances are, if you are going to remodel a bathroom, you’ll want to do more than just put in a new tub or shower. While we’re at it, our team can also install new flooring, a new vanity cabinet, updated lighting, and more. Contact U.S. Patio Systems and Home Remodeling if you wish to learn more about the bathroom remodel services that we provide in the Des Moines, Iowa, area.